Impressive design sketches and 3D modelled renderings of your latest development or private dwelling not only help the unnoficiated visualise the content of plans which may look complicated on paper but often they go along way to sell them. Whether you are a developer, planner, estate agent or architect, architectural illustrations and 3D modelled visualisations enabling you to successfully market or present your buildings to clients before construction. They also help win planning approvals, help you visualise spaces, select appropriate material finishes and lighting or illustrate phasing of your projects. A trained technical illustrator, I provide a range of architectural Illustratiions from simple 2Dimensional, coloured plan view elevations and perspective illustrations to realistically modelled 3D renederings for fly throughs or superimposition onto the proposed building site. 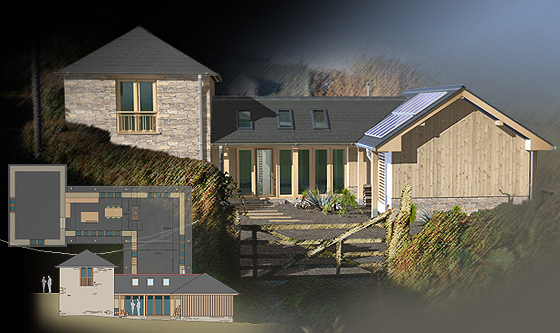 Opposite is an example of a proposed barn conversion, modelled in 3D and superimposed onto the building plot.